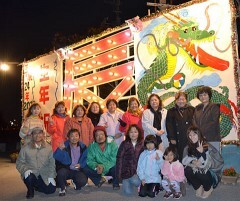 On January 4 in front of the Henza Community Hall in Yonagusuku in Uruma, the volunteers of the 20th graduating class of Henza Junior High School made an illuminated letter in the shape of character for dragon to commemorate their turning 60 this year. At two separate locations in Henza Island, to commemorate the zodiac sign of the old Chinese calendar, and the year in which they turn 60 years of age, about 20 volunteers of the 20th graduating class of Henza Junior High School of Yonagusuku in Uruma created an illuminated letter in the shape of the Chinese character for dragon, this year’s sign of the zodiac. The lights symbolize the desire to revitalize Henza Island through the activities of people born in the Year of the Dragon. The idea of making an illuminated character was started by members born in the Year of the Hare, who turned 60 years of age in 2011. Last year it was set up at only one location, by the road to the highland disaster prevention area, but this year’s group further developed the idea to two locations. The illuminated letter will be in place until the joint-celebration for people born in the Year of the Dragon, which is scheduled to be held on February 1 in the Community Hall. Tamami Yamashiro and Kiyomi Shimojo said, “Some of our old classmates cannot be contacted because they have moved. Classmates who grew up on the island are like brothers and sisters, so we hope that everyone can make it to the celebration.” For further information regarding the celebration contact the Henza Community Hall. Telephone:098 (977) 8127.